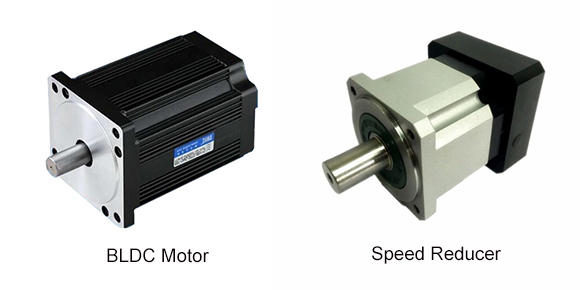 Why Brushless DC Motor be Used with Speed Reducer? Home » BLDC Motor FAQ » Why Brushless DC Motor be Used with Speed Reducer? Speed reducer is a kind of transmission equipment that can change speed and output torque, it can provide different torques and speeds. Reduction rate of the reducer= input revolutions/output revolutions. If the reduction rate is 75, then the output torque is about 75 times of the input torque. (torque increases when the speed reduces) The reduction rate of most speed reducers are constant, but actually it's also adjustable, such as the adjustable reducer on cars. Output power of the reducer will not change without reason. According to the energy conservation law, part of its energy is converted into heat energy and consumed. Generally, the working efficiency of a speed reducer varies from 60% to 98%. Why should the brushless DC motor be used together with a speed reducer in low-speed circumstances? Generally, the reduction rate of a speed reducer can be as low as 3:1 or even smaller, it may also be as big as 170:1 or even larger. For example, when the speed of a brushless motor is 1300 rpm, the output speed of reducer can be as high as 450 rpm or even greater, or as low as 7.5 rpm or even smaller. Common high torque brushless DC motors don't have such a large speed range. Even the multistage variable speed motor, the two-stage motor that has the fastest speed is about 2800-2900 rpm and the 12-stage motor that has the lowest speed is about 450-500 rpm. But if only decades of speed is required, the common brushless DC can't work. The load equipment requiring low-speed operation often requires a larger moment (such as the good ladder, up- coiler). Even the speed of brushless DC meets the requirements, its moment can't meet. How should a brushless DC motor select a speed reducer in common conditions? For example, a ATO 1500W brushless DC motor needs to be installed with a reducer, how to select? 1. First of all, we should understand that the rated torque of load equipment should be less than the rated output torque of the speed reducer, otherwise the reducer can't drive the load. 2. Then the reduction rate of speed reducer should not be too small. The judgment method is that the rated power of brushless DC motor multiplied by the reduction rate is greater than the load torque. 3. Finally, the precision control should also meet the design requirement when the torque of reducer meets the design requirements. For this reason, these two equipment are used in pair, the BLDC motor would generally be sold with the speed reducer. But any of them breaks, a new one should be purchased. And the new one should be the same with the previous one or should have the same parameters.